Travel writing as we know it was invented in the eighteenth century. Some stories were true, others pure fiction, but all fascinated readers. From Gulliver’s famous encounter with the Lilliputians to Lady Montagu’s provocative peek inside a Turkish bath, from adventures of shipwrecked sailors to narratives of those forced into slavery, eighteenth-century travel texts responded to a world that seemed to be getting bigger, more diverse, and more dangerous every day. 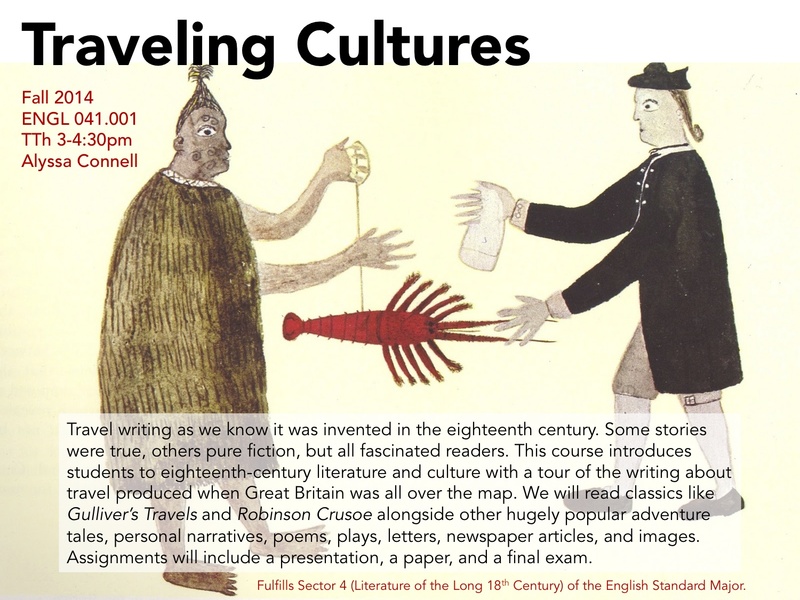 This course will explore how eighteenth-century British writers told tales of travel to work through issues of national identity, commerce, race, gender, class mobility, and imperial risk and reward. We will read classics like Gulliver’s Travels and Robinson Crusoe alongside other bestselling works of adventure fiction, personal narratives, poems, drama, letters, newspaper articles, and images. By the end of the semester, students will not only understand such broad concepts as nation, empire, Enlightenment, and commodification, but also how and why these concepts came into being. Assignments will include a presentation, a paper, and a final exam.